Child-friendly?Don’t let the fact that The Secret of Kells is an animated movie trick you into thinking it’s one that’s appropriate for kids of all ages. The Oscar-nominated movie about a boy who is called upon to help finish a magical, unfinished book is too scary for preschoolers and even some elementary school-aged kids. It features scenes of Barbarian invaders, snarling wolves and an evil pagan serpent god. It is recommended for kids aged 10 and older. 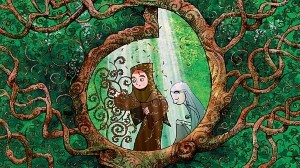 The Secret of Kells is the story of 12-year old Brendan, who lives in an Irish abbey with his uncle, Cellach. Abbott Cellach and the other monks are focused on fortifying the abbey to protect it against a Viking invasion. But a new life of adventure begins when a new monk, Brother Aidan, who is a master illuminator, arrives at the abbey with an ancient but unfinished book. Aidan initiates Brendan into the art of illumination and he must overcome his deepest fears on a dangerous quest that takes him into the enchanted forest where mythical creatures hide in order to help finish the magical book. Along the way, Brendan meets fairy Aisling, a mysterious young wolf-girl, who helps him with his journey. This Oscar-nominated movie was directed by Tomm Moore and Nora Twomey. The voice cast features Brendan Gleeson as Cellach, Evan McGuire as Brendan, Mick Lally as Aidan and Christen Mooney as Aisling. Scenes featuring Barbarian invaders may be frightening for some children. The Barbarian invaders mercilessly set fire to a whole town and bring their axes down to kill the fleeing villagers. Another scene shows a character near-death after being speared. While The Secret of Kells isn’t your run-of-the-mill animated movie, both parents and older children may enjoy learning about Irish legends and the tradition of illuminated manuscripts. In addtition, even though Brendan disobeys his uncle by leaving the abbey, he is doing what he believes he was gifted to do and helps his friend.